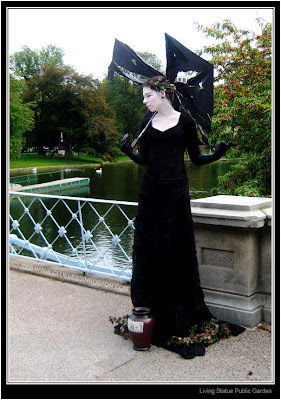 A living statue on the bridge in the Public Garden. If I tried that I'd get an itchy nose and blow it. The pic is very effective. Oh, it's the PBS Mystery statue! How cool! I adore watching the living statues- though I think I could never do it. She's lovely. Wow!! This really makes me realize how much I miss Boston[my hometown]especially in the fall. I have seen these living statues in Paris, but never in Boston! Thank you so much! !